Whole Theatre – Page 11 – Theatre from the Ground Up! Draft poster for cry of the mountain. Now we can lock in the poster, press kits and subject matter experts. Bring it, brang it, brought it. 24/7 does it again (selling out both shows). You think these plays direct themselves? We have a wonderful line up of playwrights for the next 24/7. This event will be held at Live Arts, on the downstage, February 13, 2010 at 7:30 and 10pm. Well, it was nothing less than a sell out for Peter Gunter’s new play THE GARDEN at Live Arts last week. Produced by Ray Nedzel and the NPP — part of what is now Whole Theatre. A four day run had the audience on it’s feet. Addie Horan and Andrew Cronacher performed the roles of this two character play with high caliber acting – both are destined for theatrical success. 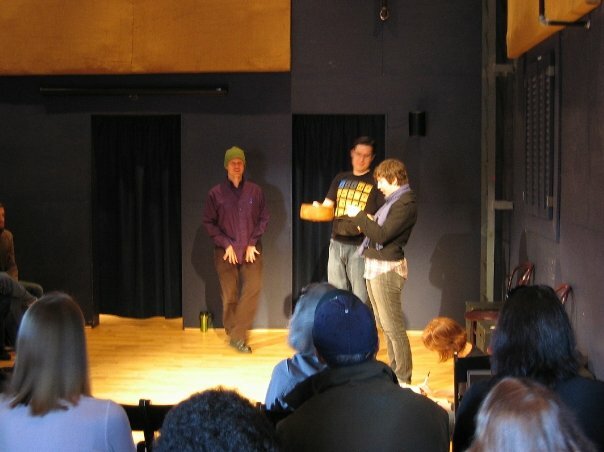 The play had been presented first to the NPP 18 months ago and throughout the following year and a half Peter rewrote it extensively with feedback from every member of the the NPP group and the community of artists and supporters who listened to table readings, staged readings, and open discussions. All were rewarded by the fine production this July in the Upstage. If you missed it, sorry. If you saw it, I’m sure you agree. That’s the way we cast it — pulling names from a hat.